Heidi Bucher began using liquid latex in the late 1970s upon her return to Zurich after a spell living in Southern California. She most famously used the medium to produce what she called Häutungs or “skinnings.” Applying it atop fabric that had been carefully pasted onto the surfaces of buildings—most often but not exclusively the interiors of structures she had inhabited—Bucher would let the latex dry and then peel it off, producing a supple rubber sheath literally embedded with traces of the past, a physical transcription of the memory and history of the space. Somewhat presciently, Bucher’s process suggests that the past is not adequately accessible through narrative alone: The passing of time is also material—a near-geological process of molecular sedimentation—and this requires novel tools. That Bucher, who died in 1993, is not more widely known is a strong indication that the project of feminist art history is far from over. Her pathbreaking work presaged such iconic nineties work as Rachel Whiteread’s House, 1993, and Do-Ho Suh’s The Perfect Home, 2002, and she justly deserves the attention she is currently getting. Delicately suspended from threads, the “skinnings” that make up Herrenzimmer (Study), 1977–79, are arranged so as to recreate her father’s study allowing one to walk into what feels like a ghost of that room. Parquet Floor of Study in Winterthur–Wüflingen, 1979, a wall piece, alludes to a dialogue with Minimalism. The crisscross pattern of the first surface is clearly visible across the forty-two identically sized sections of the piece, which, when not on display, can be neatly stacked and put away in the accompanying monogramed antique chest. Having developed a sculptural method that seems to seize time, Bucher, in later works, used latex to arrest another flow—that of water. 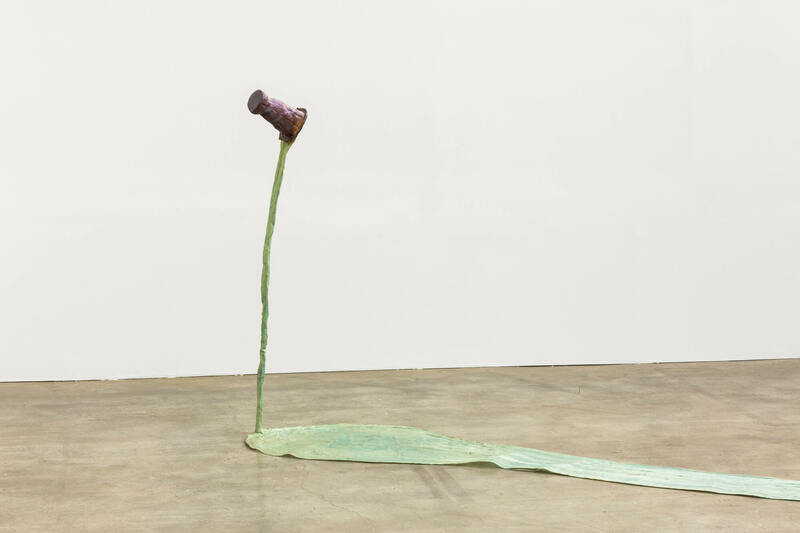 In Jetzt Fliesst das Wasser Aus der Vase (Now the Water Flows Out of the Vase), 1986, water pours out of a levitating purple vase, collecting in a long pearly pool across the floor. Ultimately, the real strength of these works may be entirely unintended. The cured latex, yellow and stiff with age, heightens their abjectness—the end of the pool of water looks like a dried-up condom. Time has triumphed after all, hardening Bucher’s skins into hides.